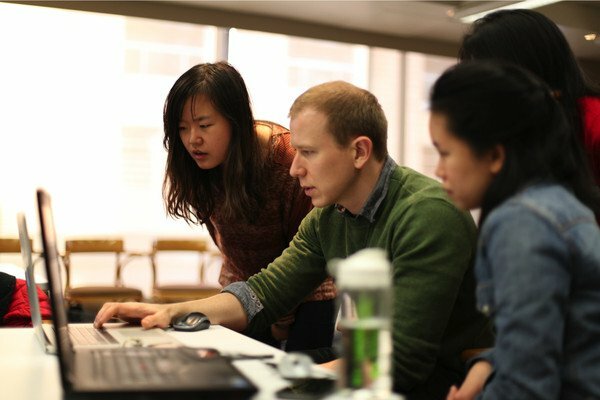 During Harvard University’s winter session, Will Walker and Craig Broady of Formlabs led a class on designing for stereolithography at the Graduate School of Design. There, a talented group of graduate students learned about optimizing and printing their designs on the Form 1. Iteration is key to successful 3D printing, and the class was built around this idea. Having never used a Form 1 before, each student brought a print-ready file to the first class. After a brief introduction to PreForm, setting up prints, and post-processing, students printed their own pieces on the Form 1. Craig and Will also discussed each model and gave design critiques in the context of stereolithographic 3D printing, allowing the students to improve their designs for the next day. Our 'cat' printer (decorated with black vinyl adhesive) prints in white. After cleaning their prints and examining the parts, students discussed their results and how their designs could be improved further. Most students found that their parts printed better than expected, and added further complexities to their models. Through this iterative process, the students were able to understand the design conditions of stereolithographic printing and how to design for more efficient prints. On the third day, students had one last opportunity to print their third part iteration. After just two days of working with the Form 1 and PreForm, they were 3D printing superstars. Check out some of the pictures below to see their final prints! We're really impressed by all of the great work and we're looking forward to more!